Once again, outside interference in Palestinian affairs caused severe harm to Palestinians, and also set back the very ambitions those outsiders wished to advance. Western infatuation with him while trying not to blame the man himself. Brown’s latest entry at Foreign Policy furthers this line of thinking within the framework of what might turn out to be Fayyad’s denouement on the Palestinian political stage. Brown sells Fayyad a little short in some ways, but his purpose is to break the mystical aura. 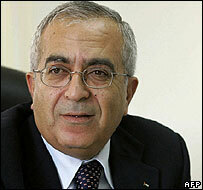 Still, we should note that there have been real accomplishments under Fayyad. I’ve pasted below the full text of what is, according to the Palestinian National Initiative (Mustafa Barghouti’s organization), the new Palestinian unity agreement. My thanks go to independent journalist Jared Malsin for alerting me to this translation, and to Ma’an News’reporter and English Editor George Hale for the list of signatory organizations. Palestinians clearly want unity, but will this text bring it? The translation is rough in some places, and there is a distinct lack of clarity in some areas, making me wonder if the former hasn’t led to some of the latter. But on the whole, this agreement doesn’t say much that hasn’t been reported already. I’ll just make a couple of points. There is a good deal here about healing the rift that has developed between Gaza and the West Bank. It’s unclear how that can be accomplished while Israel lies between the two territories, and is not likely to be disposed to allowing passage between them. Elections could be a problem as well, although Israel did allow Hamas to campaign in 2005. Still, given that experience, it’s hard to count on such “largesse” again. There are two passages that seem to be key, but are very vague in their wording.